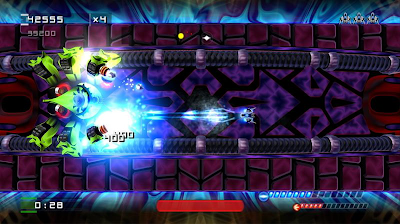 PomPom Games have just secured a deal to distribute their recent games via Steam, and the first title to drop will be an enhanced update to their 2001 award-winning release Space Tripper, now under the name Astro Tripper. I actually picked up the beta version of the game via PomPom's website a couple of years back (where it is still being sold for just shy of a tenner), and it's one of my all-time favourite PC shooters. Hopefully this Steam release will expose this indie to the wider audience it deserves. Astro Tripper is a an arena-style shooter that incorporates elements of Defender in it's design; your player ship enters each freely-scrolling horizontal arena and must dispose of the enemies that warp in wave by wave. Take too long, and the aliens(?) mutate into a considerably more deadly variation that homes in on you spewing plasma death at a rapid pace. Each of the four distinctly different worlds are broken down into separate levels than need to be mastered before unlocking the next, climaxing with a massive boss battle at the end of each. 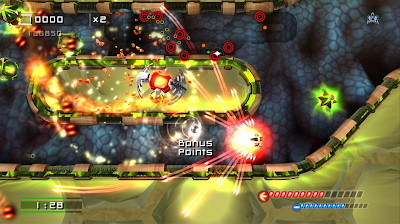 Hard and Harder settings remove the walls from the sides of the arena (as well as introducing more and tougher foes), and the tilting camera and animated background eye-candy gives the classic game a visual upgrade. It's high-octane, old-school fun, with two switchable weapon types (each with their own power-up paths), score bonuses and multipliers - and the Steam version comes with the addition of achievements, online scoreboards and unlockable challenges. Good stuff. 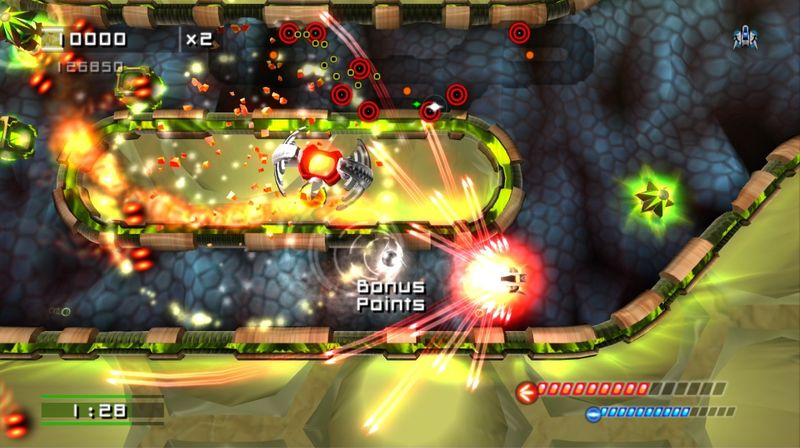 Although certainly playable via keyboard, PomPom strongly recommend using a joypad as that is what the game was originally designed for when written for the Playstation Network. I've tried it with an XBox 360 pad and can confirm that it delivers a far more authentic console/arcade feel with the movement of your craft being noticeably less slippery via analogue control. As a long-time fan of the original Space Tripper (one of the first PC indies I ever purchased), it's impossible for me not to recommend this game with two thumbs up. Sure, the arena shooter genre is old hat and quite possibly over-saturated these days, but back in 2001 when this game came out in it's original form it was still pretty fresh, and PomPom still reign as top of the class in my eyes. I'm interested to see what price point it is sold at, but not as much as I am at seeing the release of their other titles - especially the previously PSN exclusive Alien Zombie Megadeath. Astro Tripper is scheduled for release on Steam on the 15th September. Bookmark the release page here.